Happy New Year everyone! I can't believe how fast December just came and went. Time to start looking up some great places to visit in 2016! Need a fun idea for this weekend? Let's go on an ADVENTURE RIDE!!!!! Today let's go to Whatcom County? I know it's not in Snohomish County but it's an adventure ride so we are going to go explore something new and a little further away. Let's go north today. Here is a day trip idea for this weekend. Hope you enjoy it as much as my family and I did the other day! 1. Coffee and donuts at Rocket Donuts. 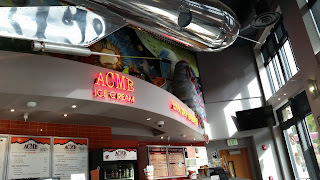 I would visit the downtown location if they are open because they are just around the corner from Spark Museum. But the Fairhaven location is on the way to downtown and just like 10 minutes away. This is place is pretty cool. The decor adds a little something more to it and makes it more than just another local donut shop. 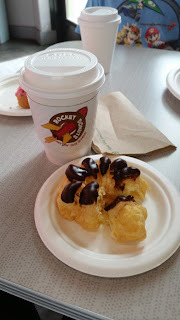 And it's one of a few places I can find a great tasting cruller. Spark Museum is so much fun if you are into old electronics and radios. They have all sorts of old, neat gadgets. They have "[a]rtifacts from the laboratories of the early pioneers of electricity, from magnets and Leyden jars to Edison light bulbs, magnificent vacuum tubes, telegraph and telephones all are well represented." They have a mock-up of the Titanic comms center. On the weekends they have the Mega Zapper show...so cool. It's lightening in a bottle on steroids. AWESOME! We were there last Tuesday and saw a small version of this show. It was pretty cool! This video is a quick virtual tour of what you will find at Spark. We went out to Deming by an old fire station and just walked over to a bridge. But I wouldn't recommend going back there. The bridge we were all hanging out at was a little scary. Many of the drivers were so rude and although we were all on the bridge and sidewalk it was still a little uncomfortable with the little ones. I would try one of the many places listed on this website: http://www.bellingham.org/activities/bird-watching/ instead. 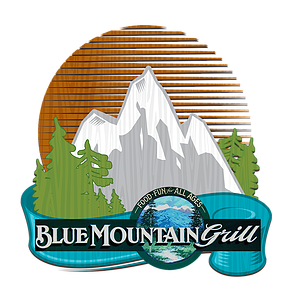 Have lunch at Blue Mt. Grill in Acme. website. Our group stopped here for lunch and it was DELICIOUS!!! My husband got the bacon, cheeseburger and just thinking about it is making my mouth water. 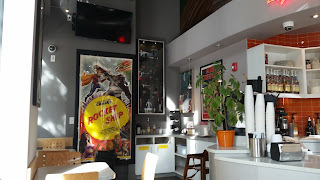 They have a little arcade in the restaurant to keep the kids busy and they have all sorts of game boards and cards to play as well while you are waiting for your food. I would not go here is you are in a hurry. The customer service was amazing but it did take a while for the food to come. The food as really good and tasted fresh and homemade. The do make their own bread for everything and it was so soft and warm. Sorry I forgot to take pictures of the place.